What are the 2012 Roth IRA phase out rules? Is it true that your Roth IRA contribution limit phases out as your income rises? 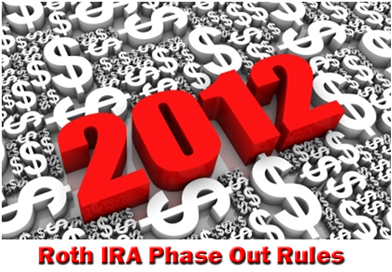 So if you plan to make a Roth IRA contribution this year, you need to know the 2012 phase out rules. Otherwise, you risk inadvertently contributing more than the allowable IRS limit. Let's take a look at when the contribution limits phase out, how much they phase out, and how it all effects you. If you earn less than a certain amount of money each year, you qualify to make the maximum allowable contribution to your Roth IRA. Likewise, if you earn too much, you're barred from making any contribution at all. But what happens when your income falls somewhere in between those two extremes? In such cases, your maximum contribution limit phases out according to where your income falls on a sliding scale. So what are these income ranges according to the 2012 Roth IRA phase out rules? Exactly where your income falls within the ranges outlined above determines how much you can contribute. So what happens if your income falls within one of these ranges? What's your maximum contribution limit? Your maximum contribution limit varies dramatically depending on your exact income. So figuring out your contribution limit requires a bit of calculation. So how do you calculate a 2012 Roth IRA phase out contribution? One way to calculate your 2012 contribution limit is to take your income, subtract the maximum income you can earn while still making the maximum contribution, and divide that figure by the phase out range for your tax filing status. Don't worry, it's really NOT that complicated. Sometimes the best way to illustrate a point is by showing instead of telling. Let's say you're married and filing a joint tax return with your spouse. For such persons, the 2012 Roth IRA phase out rules take effect if you earn between $173,001 and $183,000. You and your spouse are both 46 years old with a combined income of $178,000. At first glance, it's clear that you're ineligible to make the maximum $5,000 contribution, but it's also clear that you haven't surpassed the $183,000 threshold which bars you from making a contribution. So how much can you contribute? According to the 2012 Roth IRA phase out rules, you can make a contribution that's 50% less than the maximum Roth IRA contribution for your age bracket. So, in this case, $2,500 is the maximum amount you can contribute. Once you reach age 50 and the maximum Roth IRA contribution rises to $6,000, your contribution limit under the same circumstances is 50% of $6,000. Which, of course, is $3,000. Let's say you file your taxes as head of household. In such a case, the 2012 Roth IRA phase out rules take effect if you earn between $110,001 and $125,000. Let's also say you're 28 years old with an earned income of $114,500. Since your income falls within the $110,001 to $125,000 range, how much can you contribute? According to the 2012 Roth IRA phase out rules, it means you can make a contribution that's 30% less than the maximum Roth IRA contribution for your age bracket. So, in this case, $3,500 is the maximum amount you can contribute. If you're 50 years old or older instead of 28, the maximum Roth IRA contribution limit is $6,000. So your contribution limit under the same circumstances above is 70% of $6,000... or $4,200. Let's say you're married, but you file your taxes separately from your spouse. But you aren't separated from your spouse. You both remain happily married. How do the 2012 Roth IRA phase out rules effect you? For such people, the 2012 Roth IRA phase out rules take effect if you earn between $1 and $10,000. Let's say you're 35 years old and you work part-time making $7,800 per year. Your spouse works full-time and the two of you live off of your spouse's income. That means your income is free to fund your Roth IRA. But since your income falls within the $1 to $10,000 range, you aren't sure of your contribution limit. Exactly how much can you contribute? It means you can make a contribution that's 78% less than the maximum Roth IRA contribution for your age bracket. So $1,100 is the maximum amount you can contribute. But what if you're 55 instead of 35? Which comes out to $1,320. It's really simple once you get the hang of it. While the basic math used in the examples above still applies, you aren't always going to have earned income that's a nice round number, are you? 1) Even $10 Intervals - If you calculate your maximum phase out contribution, and it doesn't provide you with an even $10 interval, simply round up to the next highest $10 interval. 2) A $200 Minimum - You can't have a maximum Roth IRA contribution limit of less than $200 unless you're ineligible to contribute at all. So if your 2012 Roth IRA phase out contribution calculation tells you you're eligible to contribute $150, round that figure up to $200. So how does all of this effect 2012 Roth IRA catch up contributions? Both of these contribution limits phase out according to where your income falls within the limit range. So if you're over the age of 50, just calculate what your contribution limit would be if you were under the age of 50. Then, tack on an extra 20%. But don't forget your $10 interval or $200 minimum contribution limit rules! The maximum contribution limit on your Roth IRA phases out as you earn more than the IRS income limit designated for your tax filing status. So before you go ahead and make the maximum annual Roth IRA contribution, make sure your income doesn't place you within the range where your contribution limits phase out. Use a percentage basis to calculate your Roth IRA phase out contribution limit. But remember, round off your contribution limit to the next highest $10 interval if it's not already an interval of $10. And if you're eligible to make a contribution, but your calculations tell you your maximum limit is less than $200, round that number up to $200. Follow these 2012 Roth IRA phase out rules, and you'll have no problem at all calculating your precise Roth IRA contribution limit for the upcoming year.